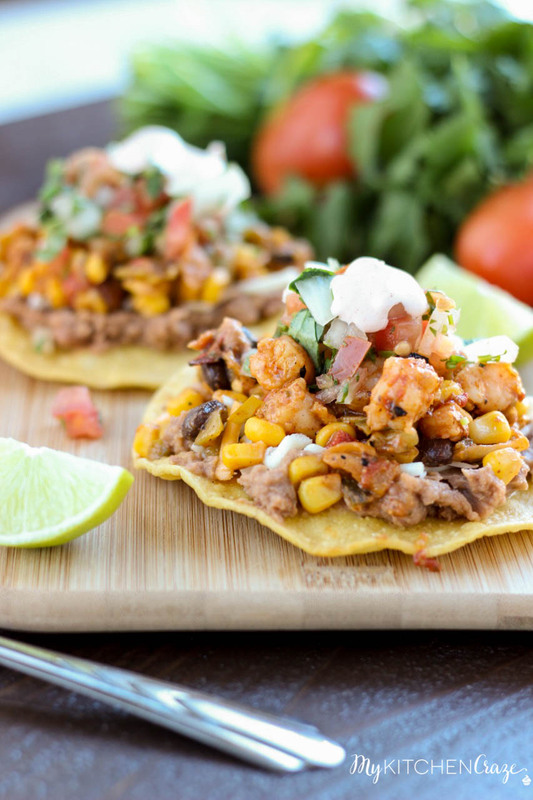 These Shrimp Tostadas are filled with scrumptious shrimp and layered with beans, vegetables and a homemade pico de gallo. These will be a winner in your home. Life is in fast forward mode and I can’t seem to stop it. My son will be starting his first season of soccer in Vegas and I’m so excited for him. He’s been dying to play and we had to wait it out until Spring season started. The only down fall about this soccer season will be that I have to drive 40 minutes to his practices and games. Before we moved I was used to dropping him off and heading home for the 2 hours. I would normally make dinner during this time, but with the soccer field being 40 minutes away I’ll need to make and feed the family before we leave. With knowing this and trying to be semi-organized I’ve been trying to compile all of my easy recipes. That way when the time comes I have a huge list to work off of. If you’ve been around my blog then you know my love for Mexican food. I’m obsessed with it and can eat it all day, every day. These shrimp tostadas are no different. I used a food hack to make them. I wanted to have they taste delicious, but without having to add all of the ingredients and taking a long time. 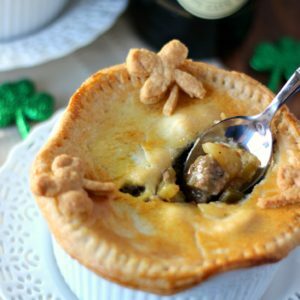 I needed a recipe that had all the same great taste, but take less time to make. Enter SeaPak® Shrimp Scampi. Have you guys eaten these delicious shrimp? If you haven’t then you need to try them asap! They are located in the frozen aisle of Walmart and taste amazing. You can use this shrimp in all sorts of dishes. One of the many reasons I love this Shrimp Scampi is because it’s already coated with butter, garlic and seasonings. When you cook the shrimp it gives you this amazing aroma and taste. Great for all sorts of recipes. We also love cooking up some SeaPak Beer Battered Shrimp. We always have to get the party size because between the hubby and son, I never get any. Ha! I love how fresh and easy these SeaPak shrimps are. Simply delicious! I’d love to hear how you’d like to #ShrimpItUp? How would you use SeaPak shrimp? If you’d like to see all of SeaPak products, you can find them here. Also get .75 off with this coupon when purchasing SeaPak products from Walmart. In a small skillet, add the shrimp scampi and cook according to box directions. In a medium skillet heat over medium heat. 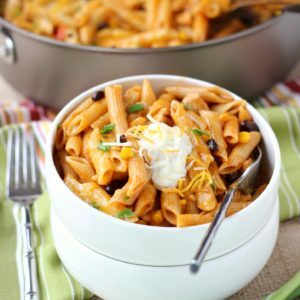 Add the frozen southwest vegetable blend, green chilies and tomatoes. Cook for a few minutes until shrimp is done. While the vegetables are heating up, add the beans to a small sauce pan and heat over medium heat, until heated through. Once the shrimp is done, cut the shrimp into quarters and add to the vegetable mixture. Sprinkle taco seasoning over vegetable mixture and stir to combine. Turn skillet to low, cover and let sit while you make the tostadas. Add all of the pico de gallo ingredients to a small bowl and stir to combine. Set aside until ready to use. To make the tostadas, add vegetable oil to a small skillet and heat to medium-high heat. Once the oil is hot, add tortilla and cook about 2 minutes (the tortilla will bubble up a little), or until tortilla is desired consistency of a hard shell tostada. Now to assemble the tostadas. Take one tostada, add beans and cheese (optional). Then add 2-3 tablespoons of the shrimp vegetable mixture. Add one tablespoon of pico de gallo and top off with garnishes. That’s so exciting that your son is starting soccer! I’m sure he’s thrilled! 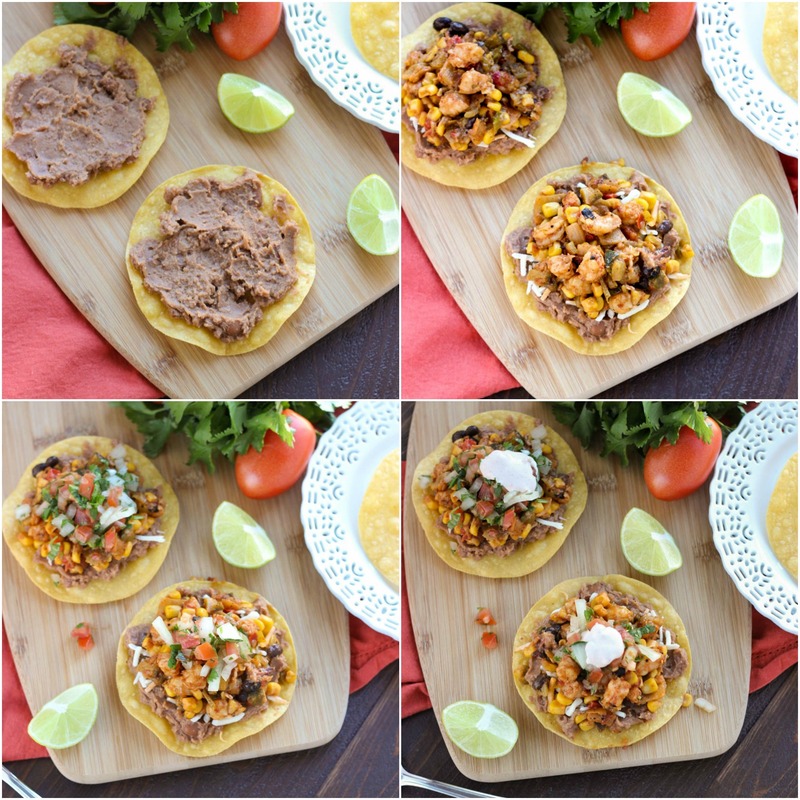 These tostadas look like the perfect easy meal to feed your family before you head out. 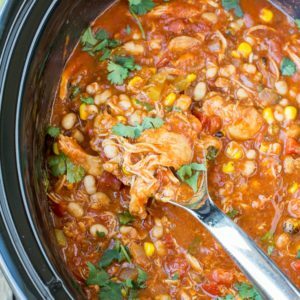 I love the use of shrimp in here, Cyndi! So perfect for my seafood loving husband and I! These are some beautiful Tostadas, Cyndi! I love all of those amazing toppings! i have been loving all the shrimp recipes today. this looks great! These look great. filled with flavor and protein. In love with all the toppings! Especially in love with how quickly these tostadas come together. Life. Savers! Oh man! 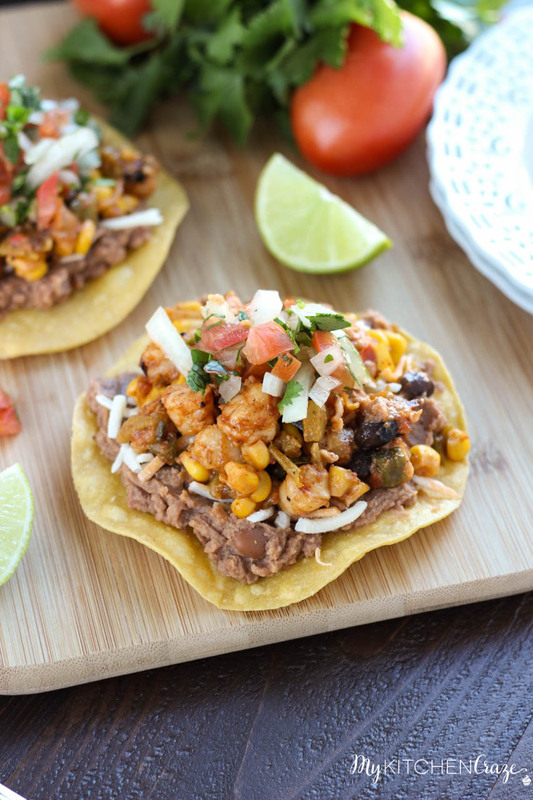 I absolutley love tostadas and these look perfect! These tostadas have my name written all over it! Lots of flavor in there! Would love to try these! Believe me, I understand that juggling act that comes with having a kid in soccer! 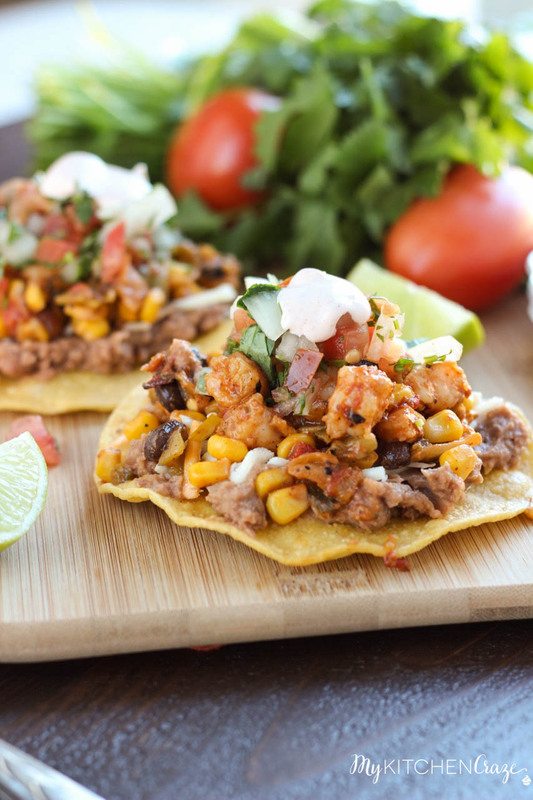 These tostadas look like the perfect meal for those busy practice nights. Holy moly 40 minutes is a long way to drive to soccer fields! 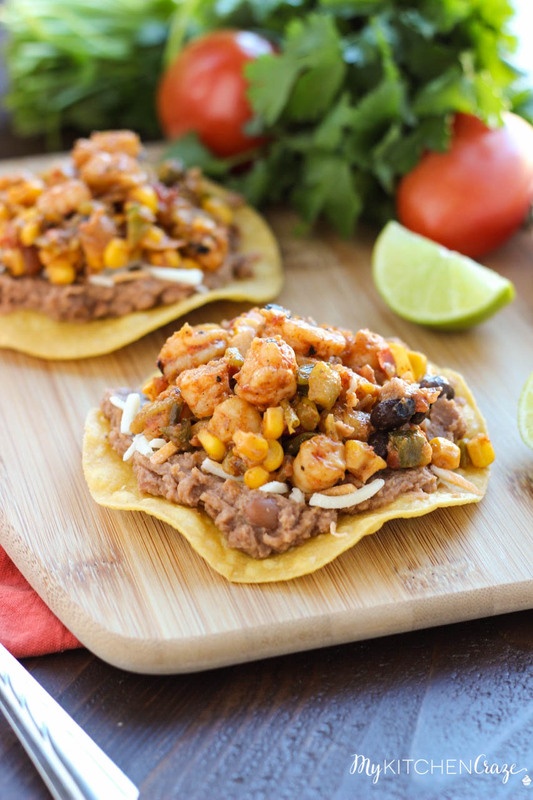 Good thing these tostadas are fast for you to make…these look delicious, Cyndi!! I could live off of Mexican food too, it is so good! 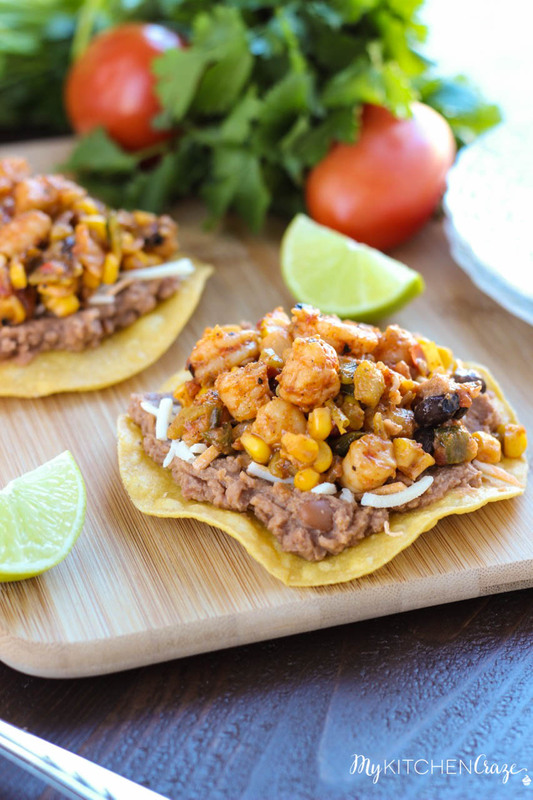 These tostadas sound delicious and what a fun way to use the shrimp too! I love Mexican food but have never had tostadas. Need to change that ASAP because they always look so amazing! These shrimp ones look incredible. 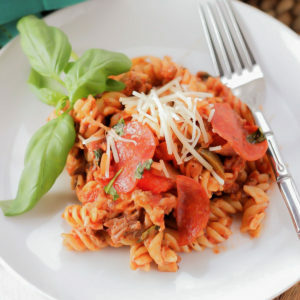 I’m going to have to start compiling a list of fast meals too, with soccer and swim club starting for the kids in another month or so – spring sports make for such busy nights!